The ‘Thala’ has already scored 413 runs from 12 matches at a strike rate of 162.59. Pune: Chennai Super Kings (CSK) skipper MS Dhoni is known to have a positive attitude, both on and off the field. To add to this, he has three fifties to his name this season. 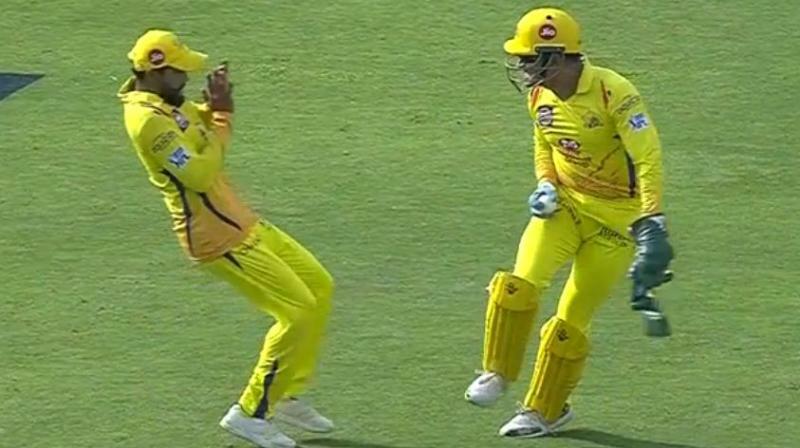 On Sunday, during CSK’s game against Sunrisers Hyderabad (SRH), Dhoni can be seen scaring Ravindra Jadeja in a very funny way. While Shikhar Dhawan scored a single from Harbhajan Singh’s delivery in the seventh over, Dhoni was seen running for the ball. Just as Dhoni received the ball easily, he scared Jadeja by attempting to throw the ball at him. While Jaddu managed to protect himself, Dhoni was seen smiling as the two players shared a light moment in the match. After losing Shane Watson (57 runs) early, a maiden IPL century by Ambati Rayudu (100 not out) and a good contribution by Dhoni (20 not out) took the hosts home as they beat SRH by eight wickets, chasing a target of 180. This was just SRH’s third loss of the season, whose six-match unbeaten run eventually ended. Interestingly, the Hyderabad team’s last loss was also to CSK, as the Men in Yellow shocked Kane Williamson’s men by four runs in a thriller in Hyderabad.